Bio: My true name is Warren, but you can call me whatever you please. Vidder and CM ever since the forums here opened. If you're reading this, then thanks for being a fan! I hope my vids can make some sort of impact. Go LVI!! Lost: A mysterious force compels Locke to fulfill his destiny. It's name... is Frank. A Donnie Darko/Lost Crossover. Lost: AU: Ana Lucia is desperate for Sayid's attention. Lost: Even heroes like Jack can feel unwanted sometimes. An abstract Jack character study - with animation. Lost: With help from our good friend Billy, Hobbes outlines the basics of making a video great. Official Training Video. Lost: Jack and Kate tell the story of their relationship. Lost: An astrological forecast courtesy of Weird Al! What would a fandom be without it? WARNING: This film may be misleading to some viewers. Viewer's discretion is advised. Lost: It's all a game to Locke and the others are his pawns. But which side does he play on? Light or dark? You decide. Part 2 - We Need a Hero! Lost: Hobbes gives some helpful tips to make your video great in this educational video. Old LVI Training Video. 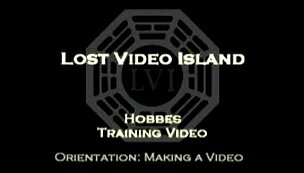 Lost: Hobbes shows you what NOT to do in this educational video.. Old LVI Training Video. Lost: Hobbes proves that a Charlie Claire video doesn't have to be slow OR boring! Lost: Fun, fast-paced, headbanger that'll keep you on your toes. Lost: A very well done ubeat pop song that really captures the strange feel of the island. Lost: A desperate, passionate look at Jack and Kate, their unsure relationship, and the danger on the island.